Let’s be honest, Kale was never destined to be a Midtown Lunch favorite. It’s named Kale, for pete’s sake. Had it been named Pork, it might stand a better chance. But it’s not named Pork, it’s named Kale. So when I looked at their menu and saw that their lunch plates cost $10.99, just north of the ML limit, I thought that was the final nail in the coffin. But, I actually try to eat healthy most of the time and I know some of you do too, even thought you don’t want to admit it. 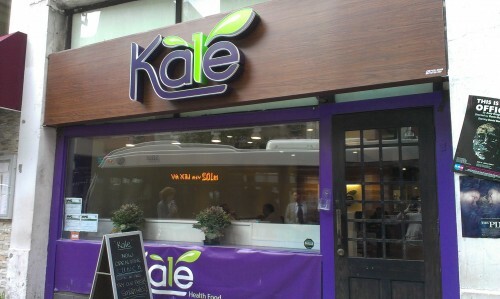 So I still went to check out Kale, which just opened last week. 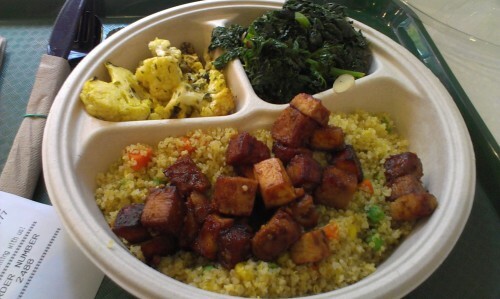 Along with my tofu, I got quinoa, roasted cauliflower, and grilled kale (it is Kale, after all). And while I know I might catch heat for this, it was all very good, darn close to justifying the high price tag. The tofu, simply put, is the best I’ve ever had. It’s grilled with a sweet and savory glaze and has a texture that’s downright meaty. It was similar to the chicken teriyaki you sometimes get where the chicken is a bit overdone and, while not dry, has some chew to it. 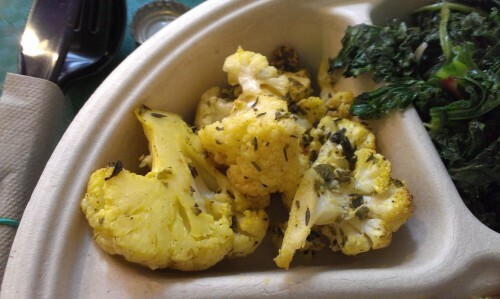 The cauliflower was roasted and seasoned with curry power. It could have been roasted a bit more, in my opinion, to get some good carmelization, but the curry gave it great flavor. The grilled kale was also good. Coming from the group of ‘Cold’ sides, it was cooked tender, but cold, of course. It came dressed with miso and tossed with almonds. According to the menu, there should’ve been cranberries too, but I didn’t get any. 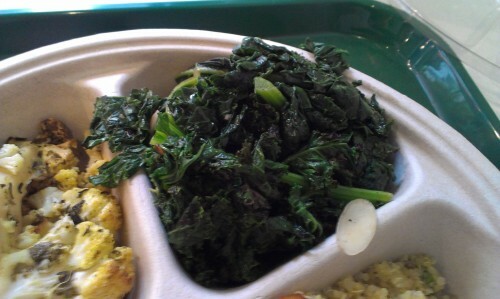 Still, Kale does it’s namesake right. The weakest part of the meal, but still pretty good, was the quinoa. It was mixed with peas, corn, and chopped carrots. 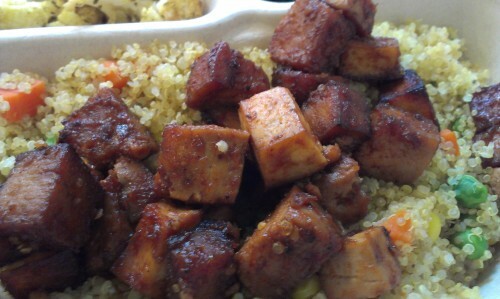 It provided a good backdrop for the tofu, but compared with the sides, wasn’t too flavorful. So there you have it. Kale offers pretty pricey health food, but as far as health food goes, it’s really good. And if they can get tofu to taste that good, I’d bet their chicken and steak is equally worthwhile. So if you’re the type that thinks good health food is worth splurging, Kale is worth a try. Posted by Dan at 10:39 am, November 6th, 2013 under Kale. That is punishment food! UGH! FREAK OF THE WEEK – The Zack is rolling in his LA grave edition. That’s what i would give to my worst enemies if I imprisoned them! No man willingly orders tofu, quinoa and kale on one plate. Goats, Cheese – it’s time for an intervention. Midnight tonite, commando raid. Dan’s vegetarian roommate keeps Dan’s testicles in a little box on the nightstand and tonight we shall liberate them. Not everyone reading Midtown Lunch has a pre-teen reaction to vegetables. Everyone is not most of us. Pre-teen??? I would spray that food like a 6 month old, sprinkler style! Exposure: Seconded. I think it looks great, can’t wait to try it.